anufacturer of mould technology DME Company has enhanced its line of Edge mould bases with a pre-pocketed option and top locks already installed to reduce lead times. With the inIdeal for producing moulds for thin parts in a variety of applications, pre-machined pockets enable a mould maker to create separate machined tools and then insert them into a pocket in the mould base, rather than machining directly into mould plates. In this way, all the mould maker needs to do is install the insert, reducing lead time, says DME. 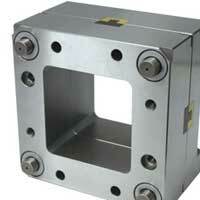 In addition, the pre-installed top locks assure better alignment of the tool to meet part specifications. Compared to only using leader pins and bushings, top locks can improve part quality. The new bases are available in five different sizes with three combinations for each size.